I'm still not feeling well today. I thought that I wasn't feeling well because of what I drank on Sunday evening. I doubt that this is still related to that. Or is it? I rarely drink liquor so is it possible that my stomach is still bothering me almost two days later? Hmmm... Or did I pick up a bug at about the same time? I'm not sick-sick, I just don't feel myself. My stomach hurts a bit and I feel kinda "blah" and tired. I have that virtual race to do after work and, whether I walk it all (okay, that won't happen, I'd get too bored) or jog it all, I HAVE to get it done. This was a huge goal that I set and I really want to achieve it. It took a lot of detours and remapping along the way but to end the year and say, "I did it. I did thirteen races." would make me feel fantastic. So, even though it'll be slow (I haven't ran since my race on December first combined with not feeling well, AND the fact that it'll be on the Treadmill of Terror - boooring! ), I have to do it. Obviously I'll slow it down and walk if I don't feel well. I'm not going to push myself too hard when I shouldn't. BUT I do at least want to jog some of it (no matter how slow). This is the perfect way to end one year and to start another. Our plans for tonight (yes, it's pretty much tonight already!) are STILL up in the air. We were invited to a friends' house, invited to meet up with some other friends when they finalized plans, invited friends over (whom I haven't heard from so I'm not planning on that given the time of day), and had discussed going out for the evening. All I know is I'm going to run, shower, and then get ready for whatever we decide to do. Heck, depending on how I feel we might end up home, in our comfy clothes, on the couch...Just the two of us! I'm kind of on the fence... On one hand I'd love to get all dressed up and have a night out. On the other, I wouldn't mind keeping it more casual or even staying home. My problem? It's COLD. And snowy. And windy. I'm not sure that I want to get all dressed up (because, for me, this obviously includes a cute, sparkly LBD and heels...Neither of which goes along with this Winter weather). I'm also still not sure how I feel. I'm kind of blah and consuming adult beverages (um, especially in the cold!) does not sound as though it will be all that appealing right now. Of course, not drinking would make me the perfect candidate for DD for whomever in our group goes out. I'm pretty sure I'm still "good" from having drank on Sunday. Then again who knows how I'll feel in a couple hours. DD or not, I hate driving in this stuff and the idea of driving home in it late at night is even less appealing. Hmmm....Maybe I'll just leave it up to the man to decide, which he won't want to do. I guess we'll see how things are after I get this virtual race done. I suppose I should get moving on that... Gotta get it done while I'm feeling up to it! I'm also thinking that if I feel up to it after I might do a round of some moves with my new weights, just to give them another spin. At any rate, I don't want to leave myself TOO short on time, so I'm off to workout! Happy New Year!!! I wish you all the best in 2014! I set a goal to participate in (at least) 13 races this year. My total for the year, had I done what I had planned out would've been 14 for the year. I've definitely had some struggles come up that I didn't anticipate. One big lesson that I learned is to not register too far in advance for races!! Things come up that you may not plan on and changes must be made. It's definitely attainable to do at least a race a month (or an average of) but sometimes you need to schedule a little closer to the date. Some events should be planned in advance, especially if the event involves a large trip or a race that sells out quickly. But some smaller races can wait until a month before- or even a few weeks before! I had races planned for May, June, July, September, October, and November that I didn't participate in. Luckily some months I doubled up on races. What happened to my races? The one in May I didn't make it to because I had car trouble. My fuel pump went out and we didn't make it to Chicago. I'd really been looking forward to that one. It was the Race to Wrigley 5K, in which I would've been able to run through the concourse at Wrigley Field. We had severe thunderstorms forecast, with possible high tornado-like winds the day of the race in June. My Mom was going to go with me and we decided to play it safe and cancel. It would've been a long drive to end up not doing it. Plus, I had just started hanging out with my boyfriend and wanted to spend some time with him. 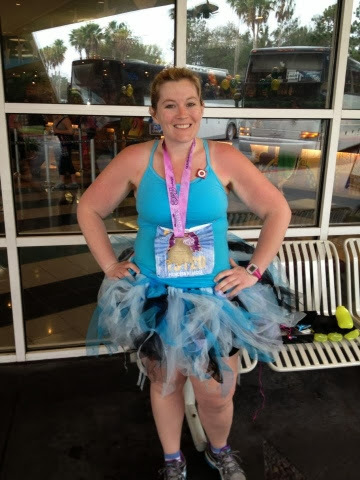 In July I had planned to do two races in Chicago. One (Color Me Radd 5K) I deferred to another race, closer to home, in October. The other I was going to do with a friend but she ended up moving so I didn't go either. It was the Rock N Roll Mini (5K). I didn't want to pay the cost of a hotel for a race I'd be doing solo. Especially since I'd planned on going to Chicago for a fun trip the next month. Hotels there aren't cheap in the Summer! 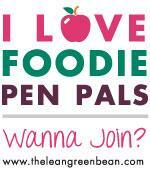 I was going to do Pretty Muddy in Chicago in September, but had something else come up so I didn't make it. October was an interesting month... Instead of doing the race I'd deferred from July, I ended up doing a completely different race that was even a little closer to home. Later in the month I went through a bad tim/a bit of a depression, and my Grandpa had a stroke so I didn't make it to Monster Dash. Being with my family was more important to me than a race. In November I had planned to do a Turkey Trot with my cousins. Again, weather messed that up. It was about an hour and a half to the race city, on good roads. We got a really bad Winter storm the night before and decided to skip it. I have one race to do to reach 13 for the year. I will likely do that tomorrow after week - seems like a good way to end the year. With all the ups and downs I've had with healthy eating, fitness, and weight over the last several months, ending the year by doing a virtual 5K will be like ending the year on a high note. US Road Running has a virtual race that must be done by the end of the month. Tomorrow afternoon sounds perfect! You can do their races for free or pay $15 and they will mail you a medal. Super cool! Naturally I paid for the medal. You also have the option to print out a paper bib. It looks like they do these races monthly. They have team events as well. It sounds like a very reasonable option for someone wanting to do a certain number of races who can't get to them for whatever reason. I will still participate in races next year, but I'm pretty sure I'll be doing a couple of these as well! How did I manage to reach my goal by cancelling so many races? I added more to the list! Had I done every race that I had planned to do, and with those that I added, I'd have done 20 races... Well, 19 I guess because I wouldn't be needing to add one more to make 13! The races I did this year were 5Ks, 10Ks,a 7K, a 5 miler, and a half marathon. 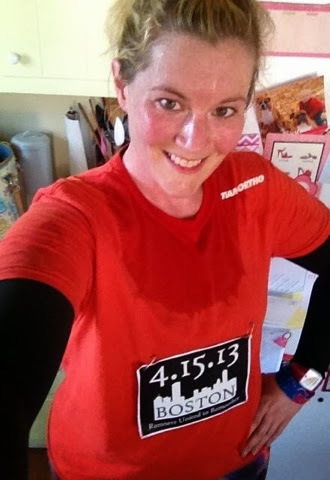 Two of my races were virtual (a Run for Boston 5K in April and the one I'm doing tomorrow). You can view the names of all my races on my "13 in 13" page. I'm sending the best of my bibs (some races I didn't get a bib for or it was a generic bib) to Mile 22 and having a bag made. This was my reward to myself for completeing a minimum of 13 races this year. The one I'm looking at fits 12 bibs on it, so I should be set to send in all that I have from this year. I may not submit my virtual bibs because they're printed on regular computer paper...I'm not sure how those would hold up in sewing. I'd rather have all of my "good" race bibs put on there and save those in my scrapbook with others. 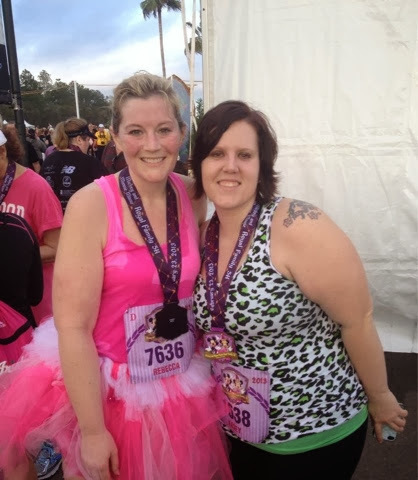 My friend Kasey and I (dressed in an Aurora-inspired outfit) after the Royal Family 5K (day before the princess half - we did both races). Showing support by participating in "Run for Boston." I counted this as a virtual 5K. 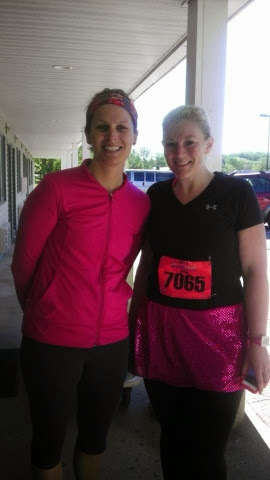 My friend Angela and I after the Bayshore 10K in Traverse City last May. 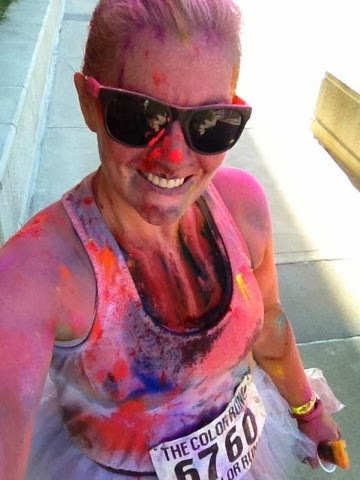 After the Grand Rapids Color Run in August. 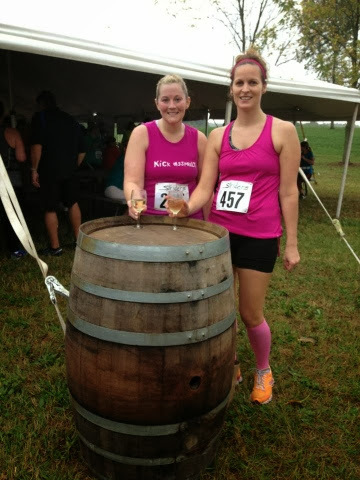 Angela and I after a 5K through a vineyard in October. We didn't plan to coordinate our tops! 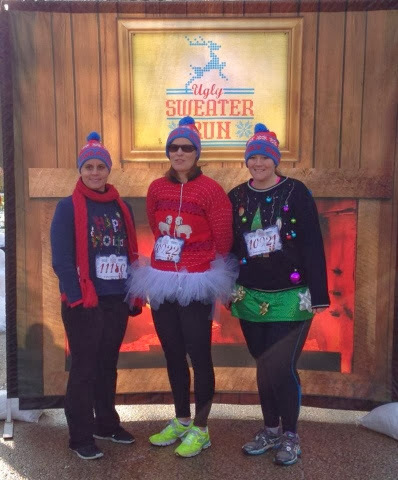 My friends Sandy, Angela and I before the Ugly Sweater Run in Grand Rapids in December.